Will you be cruising the waters on your boat or camping out in your RV this year? Besides the pleasure you can enjoy through your personal property, you may also be eligible for tax breaks, if certain requirements are met. Following is a brief rundown of four prime tax-saving opportunities. 1. Chartering activities. It's common for some boat owners to charter out their vessels for sightseeing or fishing excursions when they're not being used personally. In other words, this becomes a sideline business that allows you to recoup some of your expenses. Notably, you can use expenses to offset the taxable income from chartering activities, including the cost of fuel, repairs, insurance, supplies, equipment, mooring and storage, and even fishing gear or binoculars. Plus, you're entitled to a generous depreciation allowance for the vessel itself. Of course, your deductions are based on the percentage of boat use that's business-related. For example, if you charter out the boat 50% of the time, you can deduct 50% of the expenses. Finally, be aware that you could run into troubled tax waters if the activity is treated as a hobby, rather than a business. Under the Tax Cuts and Jobs Act (TCJA), hobby expenses are generally disallowed for 2018-2025. Also, a business operation may trigger other tax consequences (for example, self-employment tax for a sole proprietor). 2. Mortgage interest. Typically, you can deduct mortgage interest on a qualified residence, like the main place where you live, but you're also entitled to interest deductions on a second home, like a vacation home. Surprisingly, the "residence" can also be a boat or a RV. To qualify for this tax break under the tax code, the boat or RV must have sleeping, cooking and toilet facilities. So, if your boat has a galley, sleeping quarters and a head, you should be in the clear. You can't just barbecue on a boat's deck or throw a sleeping bag down below. 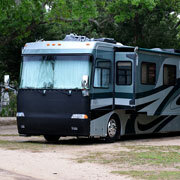 Most RVs have the requisite facilities for this deduction. Keep in mind that the TCJA imposes new limits on mortgage interest deductions for itemizers. It lowers the threshold for new acquisition debt from $1 million to $750,000, but prior loans are grandfathered. It also generally eliminates the deduction for home equity debt. 3. Charitable donations. Maybe you want to upgrade your boat or RV or your passion for boating or camping is waning. In any event, you might decide to donate the boat or vehicle to charity. Assuming certain requirements are met and you itemize deductions, this could provide a tax windfall. As a general rule, you can deduct the current fair market value (FMV) of the boat or RV on the date of the donation. For instance, if you bought the RV for $80,000 years ago and it's now worth $50,000, you deduct $50,000 on your personal return. But don't leave matters to chance. Obtain an appraisal from an independent professional. An appraisal is required anyway for property donations above $5,000. Other special rules may come into play. For instance, the charity must use the boat or RV to further its tax-exempt function. Deal with a qualified charitable organization that is experienced with these types of donations. 4. Sales tax. Depending on your situation, you may be able to deduct the sales tax you pay when you purchase a boat or RV, although the rules have been complicated by the TCJA. Previously, you could deduct all of your state and local property taxes, plus either your state and local income tax or sales tax. But now the total annual deduction for state and local tax (SALT) payments is limited to $10,000 for 2018-2025. If you opt to write off sales tax instead of income tax as part of your annual SALT deduction, be aware that you can use either the actual tax paid, based on records, or an amount from a convenient IRS table. Generally, the actual expense method will produce a bigger deduction. Caveat: If you choose the table amount, you can add on sales tax from certain "big-ticket items" — like boats and vehicles! These are just four ways you may benefit tax-wise from boats or RVs. At other times, you might use the property as transportation for hire or even claim home office deductions if you qualify under the strict letter of the law. Moral of the story: Be aware of all the tax-saving possibilities for these prized possessions. The following table provides some important federal tax information for 2019, as compared with 2018. Many of the dollar amounts are unchanged and some changed only slightly due to inflation. When you adopt a child, you could bring home more than a bundle of joy. You may also be in line for a valuable tax credit. Can Your Research Credits Offset Your Payroll Tax Bill? Does your small business engage in qualified research activities? If so, you may be eligible for a research tax credit that can now be used to offset your federal payroll tax bill. Are you Eligible for the Health Insurance Premium Tax Credit? The Affordable Care Act established the health insurance premium tax credit (PTC). It first became available to taxpayers in the 2014 tax year. If you or a loved one is eligible for this refundable credit, it can be claimed even if the taxpayer doesn't owe federal income tax for the year. With the school year now in full swing, many people are thinking about ways to lower college costs for their children and grandchildren. The College Board estimates that the average cost of college for the 2013-2014 school year was $40,917 at private not-for-profit four-year colleges and $18,391 for state residents at public four-year universities. These figures include tuition, fees, room and board. But they don't cover incidentals, such as books, supplies, transportation and personal expenses. If college expenses increase at 1.5 percent annually over the next 18 years, a baby born in 2014 can expect to pay roughly $54,000 for his or her freshman year at a private university (or nearly $24,000 for a state resident at a public university). Statistics like these cause many people to question whether the benefits of obtaining a college degree outweigh the mounting costs. On-time graduation rate. The sure-fire way to break the budget is to stay in college for an extra year (or longer). Schools with high on-time graduation rates typically provide rigorous advisory services that keep students on track. Strong business ties. Pick a college that works with outside organizations to provide internships to students. Students may earn college credit, on-the-job training and extra spending money. In addition, interns who prove themselves worthy may receive job offers. Career services. Many of today's college graduates have trouble finding employment in their chosen fields of study. Pick a school that hosts job fairs and provides career services that help place students in paying jobs as soon as possible after graduation. A recent study attempts to answer this question. In September, the Federal Reserve Bank of New York reported on the value of a college degree, using two common financial investment metrics: Net present value and accounting payback period. The study estimates the average incremental cash flows that college graduates earn over people with only high school diplomas. Outflows. Incremental outflows include tuition and fees over four years of college. They also include the "opportunity cost" of foregone earnings as undergraduates pursue an undergraduate degree, rather than earn money in the real world. Inflows. Incremental inflows are measured by the "college wage premium" over a 40-year career. This premium is reported quarterly by the U.S. Bureau of Labor Statistics in its Usual Weekly Earnings Summary. It represents the extra wages the average college graduate earns compared to the average high school graduate. For example, in the second quarter of 2014, the average person with a college degree earned $1,187 per week, compared to $666 for the average high school graduate. This equates to a college wage premium of $521 (or 78 percent) per week. The study estimates that the net present value of these cash outflows and inflows over the average person's career is roughly $300,000, assuming a 5 percent discount rate. After adjusting for inflation, this value has remained constant since the late 1990s. The accounting payback period -- the number of years it takes to recoup the initial cash outflows without considering the time value of money -- is approximately ten years, according to the study. This metric has fallen over time and is near its all-time low, which supports the hypothesis that a college degree is a smart investment. Of course, this study isn't perfect. It assumes that a student will complete college in four years -- although many students take five years (or longer) to graduate. It also assumes that college graduates will earn the "college wage premium" right away -- although many of today's graduates are unemployed or under-employed after graduation. And it fails to consider that the typical college graduate may possess innate skills and abilities that would enable him or her to earn more money, regardless of education level. Part of the appeal of the Federal Reserve Bank of New York study, however, is that it frames the decision to pursue a college degree as an investment decision. The study looks at the run-of-the-mill scenario. However, students and their family members can take steps to improve the return on investment by lowering costs. A recent IRS news release urges students and parents to review the eligibility criteria for education tax benefits now, before the 2014 tax filing season begins. Two credits are available to taxpayers who pay qualifying expenses for an eligible student. Eligible students include the taxpayer and his or her spouse and dependents who are enrolled in an eligible college, university or vocational program. Taxpayers don't need to itemize their deductions in order to qualify for these credits. However, neither credit can be claimed by a nonresident alien, a married person filing a separate return or someone who's claimed as a dependent on another person's return. Although you may qualify for both, you can only claim one credit per student in a given tax year. Here's some information to help you decide which works best for your student. It's only available for four tax years per eligible student. It's available only if the student hasn't completed the first four years of post-secondary education before 2014. It's only available to students who were enrolled at least half-time for at least one academic period beginning in the tax year. Qualified education expenses are amounts paid for tuition, fees and other related expenses for an eligible student. Other expenses, such as room and board, are not qualified expenses. The American Opportunity Tax Credit equals 100 percent of the first $2,000 spent and 25 percent of the next $2,000. That means the full $2,500 credit may be available to a taxpayer who pays $4,000 or more in qualified expenses for an eligible student. The full credit can only be claimed by taxpayers whose modified adjusted gross income (MAGI) is $80,000 or less ($160,000 for married couples filing a joint return). The credit is phased out for taxpayers with incomes above these levels. No credit can be claimed by joint filers whose MAGI is $180,000 or more ($90,000 or more for singles, heads of household and some widows and widowers). Forty percent of the American Opportunity Tax Credit is refundable. This means that even people who owe no tax can get an annual payment of up to $1,000 for each eligible student. Lifetime Learning Credit. This credit provides a maximum credit per tax return (not per student). Although this credit is available for both graduate and undergraduate students, it generally works better for part-time and graduate school students. There's no limit on the number of years you can claim the Lifetime Learning Credit. Tuition and fees required for enrollment or attendance qualify as eligible expenses, as do other fees required for the course. Additional expenses do not. The Lifetime Learning Credit equals 20 percent of the amount spent on eligible expenses across all students on the return. That means the full $2,000 credit is only available to a taxpayer who pays $10,000 or more in qualifying tuition and fees and has sufficient tax liability. Income limits are lower for this credit than for the American Opportunity Tax Credit. For 2014, the full credit can be claimed by taxpayers whose MAGI is $54,000 or less ($108,000 for married couples filing a joint return). The credit is phased out for taxpayers with incomes above these levels. No credit can be claimed by joint filers whose MAGI is $128,000 or more ($64,000 or more for singles, heads of household and some widows and widowers). There are several differences and similarities between the American Opportunity Tax Credit and Lifetime Learning Credit. You can claim both benefits on the same return but not for the same student or same qualified expenses. In other words, there's no "double benefit" allowed. By the end of January, taxpayers should receive a Form 1098-T, Tuition Statement, from their educational institution(s) for the previous year's tuition and other expenses. However, amounts shown on this form may differ from amounts taxpayers are eligible to claim for these tax credits. So, always consult with your tax adviser to ensure you claim the correct amounts and to explore tax advantaged ways to educate your children and grandchildren. Two new court decisions reached opposite conclusions about whether individuals in states that do not operate their own health insurance exchanges are eligible for the premium assistance tax credit under the Affordable Care Act (ACA). Here is what you need to know about the controversy. Seasonal workers can give you a lifeline to survive crunch periods like the upcoming holidays. However, it's wise to consider the implications carefully and not cut any corners in the hiring process. Some federal employment and employee benefit rules apply to seasonal workers, and others may not. If you are getting ready to hire for the holidays, keep these rules in mind, along with a few practical management tips. Conitinue reading to also find out how your seasonal hire may result in a hefty tax credit. The IRS recently issued proposed regulations fine-tuning the rules governing the healthcare tax credit available to certain small employers, beginning in 2014. The Affordable Care Act contains a credit of up to 50% of premiums for eligible employers. Keep reading to learn what the new proposed regulations add to the mix. Providing healthcare coverage is difficult for many small employers but they may get a tax break for some of the costs. The IRS recently issued proposed regulations fine-tuning the rules governing the healthcare tax credit available to certain small employers, beginning in 2014. The Affordable Care Act includes a credit for eligible employers of up to 50% of premiums. This article explains what the new proposed regulations add to the mix. Echelbarger, Himebaugh, Tamm & Co., P.C. Copyright © 2011 EHTC All rights reserved. The EHTC logo in full and individual icons are trademarks of EHTC. All other logos are trademarks or registered trademarks of their respective owners.